In January of 1850, a 20-year-old Johannes Strieter set out from Freedom Township, west of Ann Arbor, Michigan, and headed north to Saginaw to pay his sister Dorothea and her husband, Missionary J. J. F. Auch, an extended visit. In Saginaw Missionary Auch picked Strieter up in his sled and drove him to their home in Sebewaing, on the western coast of the “thumb” of Michigan. 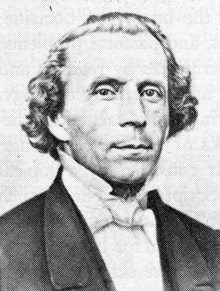 There Strieter helped out as much as he could with the Lutheran mission to the Chippewas there. He also spent time with Missionary J. F. Maier at the Shebahyonk station, about seven miles northeast of Sebewaing. Strieter clearly enjoyed his time there, including his time with Missionary Maier, who had a good sense of humor. Missionary Maier was also married to a Dorothea, the sister of Missionary Auch who had been confirmed with Strieter at Salem Lutheran Church in Scio. When Strieter left with Friedrich August Crämer to begin his pre-seminary studies in Frankenmuth in the spring of that year, after helping to build the new mission house in Shebahyonk, the parting was a sad one. In the article below, Missionary Auch describes the tragic demise of Missionary Maier in the fall of that year. By that time Strieter was actually attending the seminary in Fort Wayne, Indiana. Although Strieter doubtless heard of the tragedy, he does not mention it in his autobiography. Still today and even in English, Auch’s emotion is palpable. You can view Missionary Maier’s grave at Find A Grave. A difficult task has been assigned to me by the Lord, that of informing you and our entire synod of the terrible misfortune that befell our mission on the fifteenth of this month. Mr. Missionary Maier and another man by the name of Haushahn, a resident here, found their grave in the Saginaw Bay on the just-mentioned day. They set out from Sibiwaing on the 12th with the purpose of bringing winter provisions back home and set sail from Lower Saginaw2 for the return trip on the 15th with a favorable, though very strong wind, and when it grew stronger and stronger, and there was also such a thick fog on the sea that they could only see a short distance ahead, they came right into the worst spot of breakers on the entire east side of the Saginaw Bay, and here they were shipwrecked, perhaps a half mile from shore and six miles from Sibiwaing. Just as I was returning to Sibiwaing from Shiboyank [sic],3 Mr. Missionary Maier’s place of residence, where I had held divine service in his absence, I found a man at my door with a note from a merchant who had been so kind as to bring the boat’s cargo into his custody. This note contained the terrible news. Mrs. Missionary Maier4 was actually staying with us during her husband’s absence and was now notified of her husband’s misfortune at the same time we were. I will not describe the heart-rending scene that followed. May the Lord from whose hand this distress came also comfort us according to his great mercy. To him be praise, thanks, and honor for such mercy! The next day I rode out to the spot and found things as they had been reported to me, the mast on the boat broken off, the boat itself overturned, and the cargo scattered over a half-mile stretch of the shore. Although I rode back and forth along the shore nearly eight miles, the only thing I could find was Mr. Maier’s cap drifting along the shore. How horrible I felt! The day after that I went back to the spot of the accident with our German settlers here, who proved very devoted and sympathetic to the cause and flipped the boat back up in the water. But after we had once again searched all around in the water for the bodies for a long time and to no avail, we returned home to Sibiwaing with the badly damaged load of flour. I then discontinued any further searching until last Monday, the 25th. On that day, I once again went out to the spot in the company of our interpreter, Mr. Maier’s brother, who had made his way here at the news of his brother’s death, and with another man. Two miles above the site of the accident, I and Mr. Maier’s brother climbed ashore and, while the other men continued in an Indian boat, we went searching along the shore. On the way I found a coat belonging to Mr. Maier, in addition to other small articles from the boat. Finally we came to the place where we had found the most flour and as I turned my gaze forward, I saw Brother Maier on his face in front of me, his coat over his head, the waves beating against him, lying on the shore in water perhaps four inches deep. Calling out to his brother, I hurried over. Ugh, what a sorry sight! We turned him over, his hands were washed snow-white, his face was puce, his skull bashed in. Maier’s brother was wailing dreadfully. I did my best to comfort him with God’s Word, but the pain my own heart was in to see my brother-in-law in that condition right there in front of me—there are no words to describe it. We also found the other man just sixty paces away from Mr. Maier. We returned home. On the next day we buried them and thereby sowed the first seed corns on the mission property here in Sibiwaing that are looking forward to a blessed resurrection [cf. John 12:24,25]. Mr. Missionary Maier was faithful in his calling. I can vouch for this on his behalf in good conscience. He lived to his Lord in faith, and so we also have the assurance from God’s unchangeable Word that he has also died to the Lord [cf. Romans 14:7-9]. He lived to the age of 27 years, one month, and 11 days. I have now taken over Shiboyank again, trusting in God’s assistance. I have promised to hold service there every Sunday and, when the weather permits, once during the week too. I have also started up Indian school again. Here in Sibiwaing I am responsible for the Indians and perhaps eight German families. Consequently there is not a single hour in which I do not see myself surrounded with work on all sides. Oh, how unfit I feel for such a serious calling! There are many times I almost do not know how to keep my faith from dwindling. If God’s Word were not my comfort, I would surely perish. I therefore ask the entire synod and especially you, dear Mr. President, to remember me in your petitions to the Lord as your lowly fellow brother. May the Lord show mercy and provide another shepherd for the abandoned sheep in Shiboyank in the near future! These sheep have begged me to please earnestly stress to the synod how dire their situation is, along with the request that they be sent another spiritual shepherd in the near future. God grant it, etc., etc. 2 That is, Bay City. According to Herman Zehnder, the name of this sailing vessel was the Huron (Teach My People the Truth, p. 79). 3 Now usually spelled Shebahyonk. The location of this Native American community and mission station is today roughly identical with the unincorporated community of Weale, about seven miles northeast of Sebewaing near the mouth of Shebeon Creek. 5 The author seems to be quoting the chief of the Chippewas at Shebahyonk. We have conflicting reports on this chief’s position with respect to Christianity. His name is variously spelled Nocktschikome (letter from Friedrich August Crämer to Wilhelm Löhe, July 25, 1845), Nage-Dschikamik, Nage Dschickamik (both in Strieter’s autobiography, describing events of 1850 predating the events of this article), and Meganigischik (Herman Zehnder, Teach My People the Truth, p. 83, apparently citing Frankenmuth church records from 1849). Strieter says that his name meant Great Chief, and he describes a powwow he attended, sometime around early spring of 1850, at which the chief denigrated the Christian God in favor of the great spirit of the Chippewas and their dancing rites for worshipping him. When Strieter went back to the spot the following morning, “there lay the chief dead-drunk, with his squaw sitting next to him, watching over him.” However, we do know that the chief’s brother converted (taking the Christian name Sam) and was married in the Lutheran church in Frankenmuth, and perhaps this article is indication that the chief himself also converted later in 1850. Perhaps it was precisely because of the chief’s decidedly unchristian character and conduct earlier that same year that Auch was left speechless in response to his strong affirmation of Christian faith here. Since I was not happy with how I was doing, I was expecting my dismissal from Crämer every day. But look at this! One morning after the class hour he clapped me on the shoulder: “Cheer up, my dear Strieter. You are doing quite well. You, sir, are going to the seminary.” Now I was filled with joy. 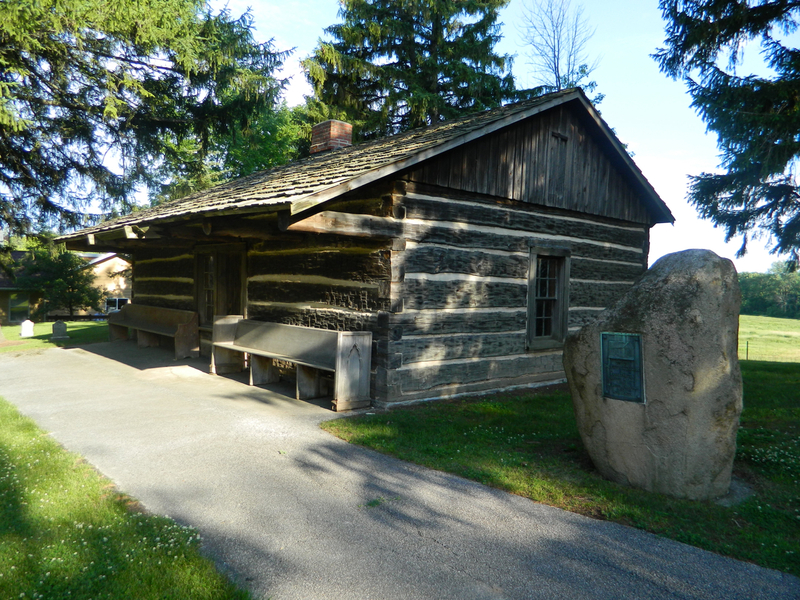 Stone marking the location of the original log parsonage in Frankenmuth, next to a more recently built museum. Copyright 2013 Red Brick Parsonage. Crämer’s house stood on the south side of the path, north of the Cass River, and was a log house. A kitchen took up the entire width on the west side of the house. The eastern side was divided – a small section toward the road was a combination bedroom and study. I can just see the diligent Crämer sitting there at his small, simple desk in front of the window. The other section was a living room. There the stairs went up. The space beneath the roof was also bisected. In the back room toward the west slept the maid and the children, and we slept in the front room – Kühn, Kundinger, and I. There were bedbugs galore. Every day there was service in the morning and in the evening. We would sing a hymn, then Crämer would mount the low, small pulpit and preach. Later we took turns singing; the men would sing one line and the women would sing the next. It was incredibly lovely. Every Friday there was private confession and every Sunday there was Lord’s Supper. The log church stood somewhat uphill from the parsonage to the west. 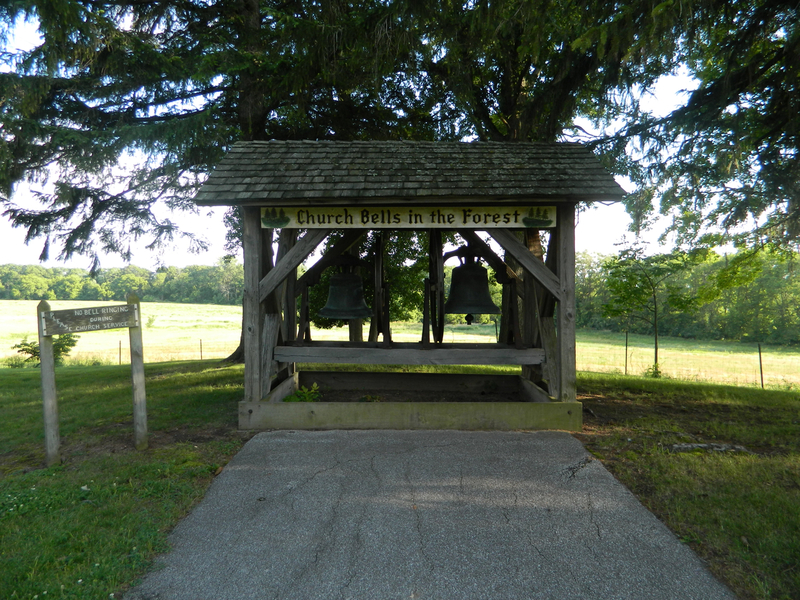 Next to the church was a framework in which two bells hung, one larger and one smaller, which the dear Franconians had brought along with them from Germany. Every day the prayer bells were rung. Then everybody would stop what they were doing on the path, in the field, in the house, the men would remove their caps, hands were folded and everybody prayed, “Lord Jesus Christ, with us abide,” and so on. It was just too lovely! There were two tall, handsome men there, the Hubinger brothers. The older one ran the farm, the younger one the mill that they had constructed on the Cass River. Everything was built very solidly and laboriously. Because of that the water could do nothing but drive either the saw or the milling gear. A fine, strong dam was there, which had a swing-gate and an exit chute. Off to the east of Frankenmuth lay Tuscola, several miles away. The people there sued the Hubingers because of their dam, for the Tuscolans were floating timber downstream. One day Crämer said to me, “You, sir, are going with the Hubingers to Tuscola today. You will appear with them on their court date and take what is spoken in English and make it German.” The two men and I went up there. We had to wait a long time. Finally we headed out of town to a schoolhouse. Hubingers had arranged for an attorney from Saginaw, who arrived on horseback. His pants were torn up at the bottom. Now the affair was underway. The attorney gave a lengthy speech and read from a book that he had brought along under his arm. The judge reached his decision: “Not guilty!” We went home in cheerful spirits, and the Tuscolans left the Hubingers in peace. One time Crämer sent me to Frankentrost to fetch Pastor Gräbner. I don’t remember what the deal was. It was Sunday afternoon. I go through the beautiful forest and come to an opening. There a path stretches out and small log houses are standing on both sides. In the middle was a long log house, partitioned: The western half was the pastor’s residence and the eastern was the church and school. I went inside. Pastor Gräbner was actually in the middle of Catechism instruction. I whispered in his ear, but he calmly went on teaching until class was over. Then he went over with me into the little parsonage. It was one room. In the one corner stood an oven, in the other a bed with a curtain around it, and next to it a desk in front of the window. That was the living room, bedroom, and study. Gräbner put on his long boots, slipped into a coat, lit up a German pipe with a porcelain bowl, hung his tobacco pouch on his coat button, took his large walking-stick in hand, and now we headed to Frankenmuth. The Frankenmuth church bells today. Strieter often rang the large bell on the right. Copyright 2013 Red Brick Parsonage. It was time for the synod convention, I believe in St. Louis. My sister in Sebewaing had a maid from Frankenmuth, a gem of a child. She had to go home to get married. My brother-in-law mounted one horse, the maid the other, and they rode some forty miles to Frankenmuth through the woods. I was supposed to go down with him to keep my sister company until the pastors came back. We rode off to Frankentrost. On the other side of Frankentrost we met up with an old path and continued on that. We came across a pole bridge that looked suspicious at the end. The wood was rotted, you could see some water there, and it looked very marshy. “We’ll get stuck there,” said my brother-in-law. I had the young horse. “I’ll get over,” I said. I turned my horse around and got a running start— I was over on the other side. Like a fox my horse easily cleared the spot, which was perhaps three paces wide. My brother-in-law came after me, but his horse didn’t quite jump far enough and his back legs sank all the way down into the muck; but he was out in a jiffy. When we were close to the bay we came to a river, which was deep, not very wide. Fortunately a canoe was available in front of us. We take the saddles off, each of us takes his horse to the side and off we go. The horses pulled that little boat across splendidly. On the other side saddles back on and we continue on our way. My brother-in-law now traveled to the synod convention. Back then you went up around the lake and then down on the Mississippi; it took a long time. “Yeah,” she says, “I don’t dare do that, otherwise the old woman will be insulted.” We ate what we could; the rest we secretly gave to the pigs. My sister opens the door to the doctor’s room and says, “See for yourself!” My brother-in-law, the missionary, was an okay doctor. He puts olive oil19 in a receptacle, makes it hot, soaks a rag in it and covers the doctor’s entire arm with it and stays up with him through the night. In the morning the arm is fine again, and nothing bad can be seen on the hand but the wound. Here comes my half-Indian [Jacob Graverad] on horseback, along with the doctor. When he enters, my doctor calls out from his bed, “Mr. Doctor, you come too late. You see, sir, I am an old, widely traveled physician. I have even doctored the wives of the sultan in Turkey, and I am unable to help myself. Mr. Missionary here knows more than I; he has cured my hand for me.” Koch ate, we foddered his horse, the doctor gave him ten dollars, and he rode back home. Crämer never stopped concerning himself with the Indians either. In an old shanty not far from the church lived an aged chief and his old wife, who was pushed to the side though, with a few of her youngest boys and the chief’s young wife and a few of her small children. On Sundays all of them would come to the parsonage after church and Crämer would give them a speech. His son Heinrich had to translate; they called him Wabshkentip, White-Head, because he had very light-colored hair.24 The old chief would justify himself though, wherever he could. After the service they would get a bowl full of corn soup with bacon, which they were mighty glad to eat. 14 In other words, they had named the settlement Frankenhilf – (God the) Helper of the Franconians – but the way things were going, they thought a better name would be Hilf den Franken – (God) Help the Franconians. 15 This was possibly Luthers Leben für christliche Leser insgemein (Luther’s Life for Christian Readers in General) by Moritz Meurer (Dresden: Justus Naumann, 1850). This was an abridgement of Meurer’s more scholarly multi-volume work. 17 This three-stanza hymn was penned by Ämilie Juliane (1637-1706), Countess of Schwarzburg-Rudolstadt. It was sung to the tune, “All Glory Be to God on High.” Juliane’s hymn was translated into English by August Crull and is, for example, hymn 71 in the Evangelical Lutheran Hymnary. 18 Rf. endnote 31 in Youth. 19 German: Baumöl. Carl Strieter renders it “oil of turpentine” here. 21 The upper street would be Genesee Street, which turns into Junction Road, and the lower street would be Tuscola Street, which turns into Tuscola Road, and eventually joins with Junction Road several miles west of town. 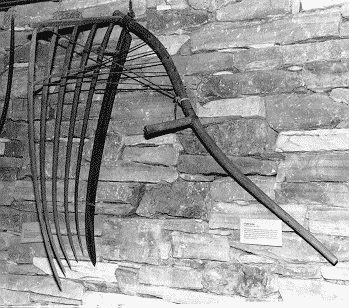 22 The cradle is also called the grain cradle or cradle scythe. It consists of an arrangement of fingers attached to the handle of a scythe, such that the cut grain falls on the fingers and can be cleanly laid down in a swath for collection. 23 Representing either one person threshing in sets of four strokes with a flail, or four people threshing together, each taking a stroke in turn. 24 According to “The Ojibwe People’s Dictionary” online, waabishkindibe means he has white hair (ojibwe.lib.umn.edu; accessed 15 September 2015). Heinrich was about 10 years old at this time and was not Crämer’s natural son, but the son of his wife Dorothea, whom Crämer had met on the ship during the voyage to America and had married shortly after landing. One time I went with him [Missionary Meyer] to a sick woman. Back in the sugar maple woods a little old woman who was almost 100 years old had taken ill. They brought her home to her wigwam. There she lay on a bulrush mat with an old squaw attending to her. Next to her lay a dead bird, green, with long legs; I believe we called it a waterhen. She kept setting the bird here and there and stroking it. The missionary told me later that it was her guardian spirit that would supposedly bring her to the Indian heaven. The missionary spoke with her about Heaven, but she would not listen to any of it. She said she was too old. Especially the other woman was very surly. The religion of the Indians was described to me this way: They believe that there is a great good spirit, Gishaemanido, and an evil spirit, Machimanido.28 Each one has many spirits in its service, which are in the animals and all around us. For example, a rattlesnake is an evil spirit. When it storms really badly, that is caused by the evil spirit, and you have to appease it with offerings. My brother-in-law once had an Indian with him in a ship when the waves were high; the Indian threw tobacco in the water. In the far west, they say, is a beautiful land with magnificent sugar maple forests and beautiful lakes and rivers. There is a lot of game and a lot of fish, but no pale-face comes there. That’s where eternal peace is found. Along the border of that land runs a deep, narrow, dark stream, with a narrow footbridge going across. A bad Indian falls off and perishes in the stream, but a good Indian gets across. Everyone chooses his own guardian spirit, like that woman chose the bird. When she was buried, I went to find her grave. There a split piece of wood was embedded in the ground at the head, and her bird was painted in green on top of it. The Indians liked me: “Bushu, bushu John,” they would say.29 I even witnessed one of their festivals. They had assembled near the creek30 in an open area. With short, thin sticks, perhaps one and a half feet high, they had staked off a longish space. In the middle stood a man with the drum, which was a hollow log covered with deerhide on both ends. He had a mallet in his hand and now he began beating on the deerhide with gusto. Another man stood next to him with a gourd, a vegetable like a pumpkin, a thick, round mass with a handle. When it is dry, it is very hard, and the seed rattles when you pound it against your hand. He now took his one hand with the thing and began pounding it forcefully against the other, so that it rattled. That was the music. When they had played for a while, a man and a woman stepped into the circle, their hands crossed against their chest and an animal pelt hanging over their arms with the scalp still on it, a weasel, a muskrat, a mink, etc. They skipped along one after the other. Pretty soon the man thrusts his pelt into a woman’s face and cries out, “Hui!” and she then jumps into the space too. The woman does the same to a man, and pretty soon the space is filled. Those in the middle play the music and the others go skipping along to it one after the other. And then pretty soon two of them leave the ring and go over into the nearby thicket. The chief, Nage-Dschikamik,31 great chief, lies on the ground nearby and has a large liquor jug in his arm. A Frenchman who knew the language was with me. The chief spoke with me through him. He told me, “We are celebrating a festival of thanks to the great spirit.” I had the interpreter tell him that that was not how a person thanks the great spirit. He replied, “He is a very great spirit, not as particular as people are. It doesn’t matter to him whether you people kneel down and pray, or whether we dance.” The next morning I went back to the festival area. There lay the chief dead-drunk, and his squaw sat next to him, watching over him. 28 These names are variously spelled. According to “The Ojibwe People’s Dictionary,” gichi-manidoo means great spirit or god and maji-manidoo means evil spirit or demon (accessed 19 August 2015). 29 According to “The Ojibwe People’s Dictionary,” boozhoo means hello! or greetings! (accessed 19 August 2015). 30 Probably the Shebahyonk River (or Shebeon Creek), but possibly the Sebewaing River. 31 The “Dsch” is probably Strieter’s German way of representing a “j” sound. Strieter spells this name two slightly different ways in his manuscript – Nage-Dschikamik here, and Nage Dschickamik later.